No. 23 Tennessee, No. 18 Notre Dame and No.22 Georgia Tech were welcomed to the tournament. Saturday, the Kick-Off began with Notre Dame and Georgia Tech in the morning and Nebraska versus Tennessee in the afternoon. Nebraska quickly defeated Tennessee in the doubles, but came to a close call in the singles. Nebraska and Tennessee were tied, and the team going to the championships on Sunday depended on the results of Lady Husker, Stefanie Weinstein. She prevailed in three sets defeating Lady Volunteer, Caitlyn Williams, 4-6, 6-4 and 6-3. Sunday, the final day of the ITA Kick off, was a little bit easier for the Huskers. Notre Dame being the winners over Georgia Tech played Nebraska in the afternoon for the Championship. Nebraska swept the doubles play, and found themselves in a 1-0 lead heading into singles. They sealed their fate with a 2-0 lead, only losing one match during the singles play. Maggy Lehmicke was the winning game, when she crushed Notre Dame player, Julie Sabacinski, 7-5, 6-4. 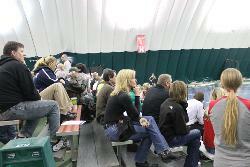 Crowned champions of the ITA Kick-Off, Nebraska now has a bid for the National Team Indoor Championship Feb. 8-11. Nebraska goes to Ohio State this Saturday, Feb. 2, at 11 a.m. for their first Big 10 opponent of the season, but their next home game will be Feb. 9 at 10 a.m. against Wichita State at the Nebraska Tennis Center. More information, scores and schedules can be found at huskers.com.